Trick or Treat, Halloween Sweets! Did someone say Trick or Treat?! With Halloween quickly approaching you can probably feel the onset of the cravings for sweet treats. This holiday is known as a day to satisfy your sweet tooth and this year, we think you should get creative with your snack choices. Halloween also doesn't have to always be about candy. Every meal can be made Halloween appropriate. Get excited for this spooky day in the kitchen and whip up some of these very tasty treats! 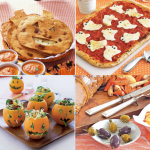 It doesn't matter if you’re hosting a Halloween party, or just getting everyone in the Halloween spirit; you have tons of options of tasty creations to make, and we have got you covered! We have a ton of recipes to share with you to help you fill your dessert, snack time, dinner, lunch box and party needs. Let’s start with the crowd favorite; dessert! You can do the basics like cookies and cupcakes, or you can step out of the box. Stepping out of the box doesn’t have to totally get rid of those basics, but let’s put a spin on them! 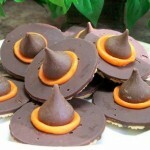 Try making these witches hat cookies! 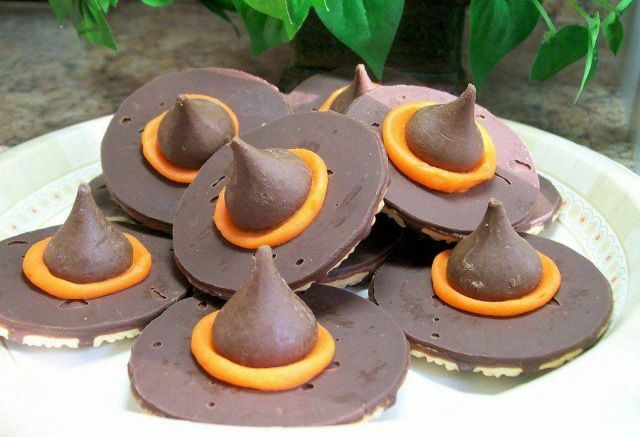 Pick up Keebler fudge striped cookies, some vanilla icing with orange food coloring and Hershey’s kisses from your local supermarket and get to work! These cookies are perfect for anytime and the kids especially will love them! Another fun idea that can be enjoyed at a party or just for an after school snack are these adorable monster pudding cups! 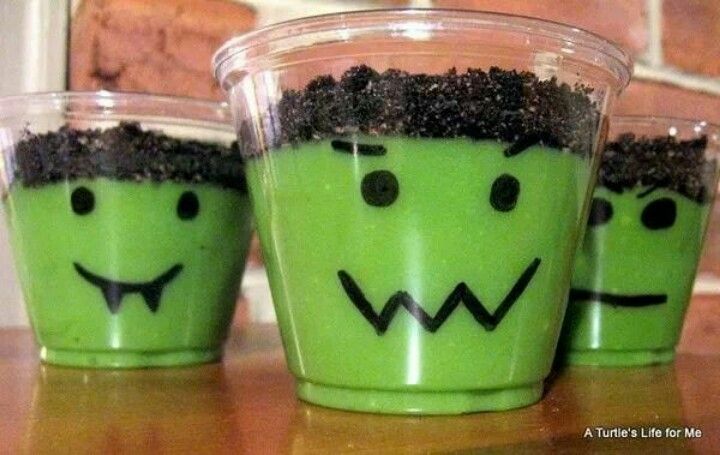 Dye vanilla pudding green with food coloring and let it settle in these clear monster face cups! 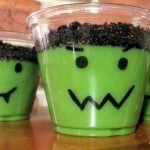 It can even turn into a fun activity for the kids to decorate their own monster face on the cups! Top the pudding with Oreo cookie crumble and you’re good to go. Who said all Halloween treats had to ruin your diet. We love these super cute ideas for Halloween treats, and loving them even more because they are healthy! Transform bananas and clementine’s into mini ghosts and pumpkins simply by cutting banana in half and creating eyes and a mouth with mini chocolate chips, and sticking a small piece of celery in the top of a clementine to make a mini pumpkin! For once the kids will be asking to eat healthy! If you are hosting a Halloween get together, try making a vegetable platter to look like a jack-o-lantern by strategically placing your favorite dips as eyes and a nose and cucumbers as a mouth! I bet you’ll love these healthy snacks just as much as we do! Dinner time does not always have to be fancy, it can be a time to get creative and fun! I came across a ton of ideas for dinner parties or just a night at home. Pick up a cookie cutter in the shape of a ghost and you can make tons of cool new Halloween dinners! Let the kids create their own pizza by rolling out pizza dough on a pan and having them place just the right amount of sauce for them on the crust and then cutting out mozzarella cheese into ghost shapes! Another fun idea is to make cornbread pieces into the shape of ghosts as well. You can pick up any Halloween shape you would like! Create your own quesadillas by cutting out eyes and a nose from your favorite type of soft tortilla and place on top of another tortilla topped with your favorite quesadilla fillers. Lastly, make “spider web” Mac and Cheese by making classic baked macaroni and cheese and drizzling melted cheese on top to look like a spider web. This is great for at home, or whip up a big batch for a Halloween gathering.